Winter Garden now offers a learn to skate program specifically designed for the future hockey player. 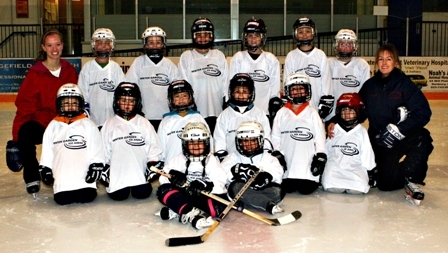 Based on the USA Hockey American Development Model Learn to Skate program, Hockey Learn to Skate will prepare your child to move into the Hockey Development Program with a basic hockey skating foundation. The program, held on Saturday mornings, will divide skaters into small groups based on ability, and will feature 50 minutes of instruction. Hockey helmet with face mask, elbow pads, knee or full hockey shin pads,and hockey gloves are required equipment. Winter Garden has complete sets of hockey equipment as well as skates and hockey helmets that children can borrow for each class. This program is ideal for the complete beginner as well as older Ice Mice graduate. Space is limited. All hockey participants from Hockey Learn to Skate, Development, Ridgefield Jaguars, Ridgefield Lady Lions, and RAHA travel programs, are required to register directly with USA Hockey. The online process is very simple, and it outlined in brief below. Players who fail to register will not be allowed to participate in any hockey program. If you have any questions, please call us at 203-438-4423, ext 101. Online registration for the 2018-19 season will be available starting April 1, 2018. 2.Choose member type Ice Player & Coach. 3. You must be 18 years of age to process a registration. Check the box that acknowledges that YOU are 18 or older. 5. Process payment – Visa, Master Card, Discover or American Express (credit or debit card). A Visa gift card can be used for payment if no credit card is available. 6.You may print your Confirmation page at this time. It will also be emailed to you immediately after the registration is completed. Once you receive the confirmation email from USA Hockey, forward it to Ridgefield Amateur Hockey Association registrar at . Each participant will pay the USA Hockey fee of $40 if age 7 or older. The USA Hockey fee is waived for age 6 (birth year 2012) and younger but the registration must still be completed to get the confirmation number. Players 7 and older who live in CT will also pay the Connecticut Hockey Conference Affiliate fee of $7.50. Those of you who live in New York will pay the NYSHA fee. The USA Hockey Affiliate fee is determined by a player’s residence, not by the state in which they play, and applies to all youth players regardless of age. If a participant plays and coaches he/she pays only one registration fee.